In the state of Georgia, if you end your tenancy and the client fails to repay your security deposit, even after requesting them to do so, this Security Demand letter is the final warning that you need to send them to get back the owed amount. It is against the state laws of Georgia to withhold a tenant’s security deposit beyond 30 days after the tenant has moved out of the rental property. If there are any legal deductions to be made, resulting from damages beyond natural wear and tear then the tenant must provide a list of itemized deductions along with the remaining balance within that period. Failure to comply, the tenant has the right to challenge the landlord in court for the withheld deposit and damages. The court proceedings could however take long before settling the matter. 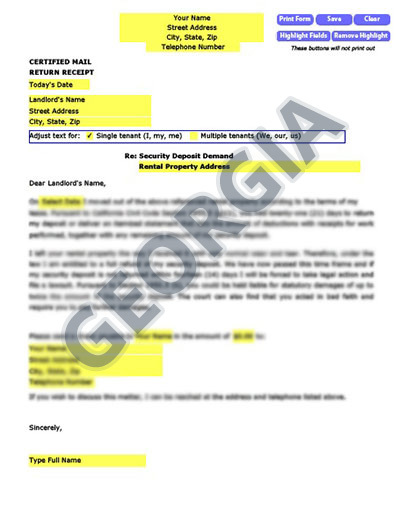 Sending the landlord a well-written demand letter referring to the Georgia state laws will easily prompt them to repay the owed amount without having to go to court. This HomeTitan’s Security Deposit Demand Letter is your easy and faster way to get back your security deposit and reminds the landlord that they are risking paying damages if you sue them in court for the unlawfully withheld amount. Sending a security demand letter is usually the best way to get back the security deposit when all other approaches out of court have failed. Be sure to document any communication and agreement with the landlord to avoid future complications in court. To get a return receipt and guarantee of the letter delivery, send it through certified mail and also save your own copy. Our letters for Georgia renters are tailored to your state, with the right laws to get your landlord’s attention. We’ve taken care of the Security Demand details so there’s no hassle on your part to find the right law and craft an approrpriate letter. Our letters have been used in Georgia and all over America with great success.